From the snippets of information I had been picking up from John Mahon’s telephone conversation, it was obvious we wouldn’t be fishing that day and most unlikely, or so it seemed, that we’d be able to get afloat tomorrow. Sat opposite John at the breakfast table of the Lungi Airport Hotel, I poked and prodded at my soggy omelette as I eavesdropped on his conversation, picking up on key phrases such as‘severe petrol shortages’, ‘fuel riots’ and ‘unobtainable’. Long before he eventually hung up and returned to his own breakfast, the gloomy expression on his face confirmed that today’s boat fishing was indeed cancelled, but he attempted to boost our mood by saying his ‘contacts’ were going to try their best to get us out fishing the following morning. It was a little before nine on a bright and already extremely hot morning. I’d been in Sierra Leone for less than 12 hours, and not for the first time I found myself wondering what on earth had possessed me to travel to a country that at the time had barely emerged from 10 years of brutal civil war. It was then a country where a little more than twelve months previous British forces were fighting in the streets of the capital, it was a country that the Foreign Office still strongly advised against all but essential travel to. 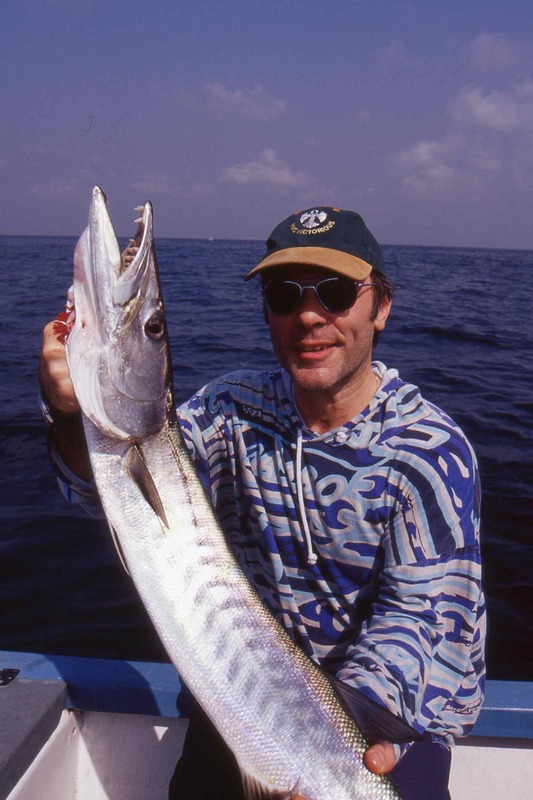 The trouble is I love visiting and fishing far flung and unusual destinations and when John and Bruce Dickinson had suggested I join them on one of their twice weekly flights from London Gatwick down to Freetown, a trip that involved a three night stop over during which we could fish, I jumped at the opportunity. 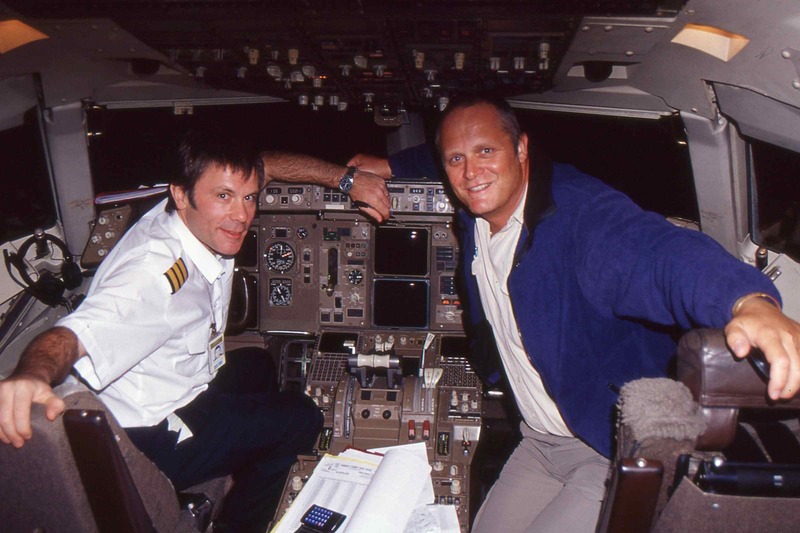 Bruce is lead singer with heavy metal band Iron Maiden, one of the most successful rock bands ever, and among his many other talents he is also a fully qualified commercial airline pilot. With Bruce Dickinson, lead singer with Iron Maiden: “let’s go fishing-in Sierra Leone! The first wave of serious doubt as to just how sensible it had been to agree to this trip had come soon after arriving at the international airport the night before. 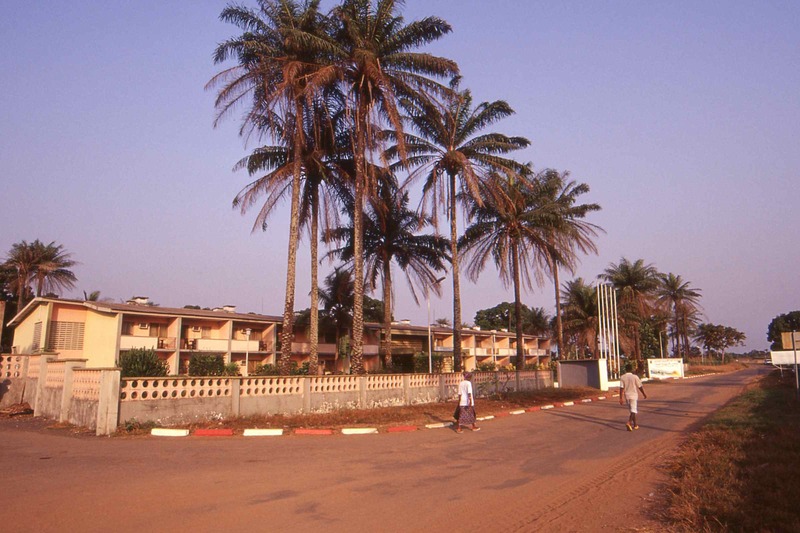 A particularly studious and rather officious immigration officer had studied my passport long and hard, stared at me, studied my documents some more, then demanded to know why I was only visiting for three days; at that time they didn’t get any tourists visiting Sierra Leone. Further doubts had already crept in when a battered and broken wreck of bus had lurched to a smoking halt outside our hotel, and we disembarked into an the inky blackness of an African night. The thick air was tinged with the smoke of countless unseen cooking fires, and when we entered the hotel we were greeted with the news that the generators had failed. It was unknown how long it would be until, or even if they could be fixed and it wasn’t so much the lights we missed, but the air conditioning-it was sweltering. We spent the first part of the evening huddled around a thin stub of candle we had perched precariously in an ashtray in John’s room, drinking luke warm bottles of Star Beer. Jokingly I’d asked Bruce whether this was where he got the inspiration to write one of Iron Maiden’s biggest hits-‘Fear of the Dark’, something he neither confirmed nor denied and yes, I did feel my neck skin crawl as I searched for the light switch on the wall! After a couple of hours the lights suddenly came on, and with it an announcement from the hotel manager that in celebration of this great event drinks that evening would be on the house. So we had moved to the hotel bar and joined the local prostitutes and drunken Ukranian soldiers for the start of what ultimately developed into a very late night. Faced with the news that our first days fishing was scuppered before it had even begun I strolled down to the beach, struggling with the intense heat as I paid for the previous nights excesses. I watched some local fishermen seine netting the beach, women gathering baskets full of diminutive little fish barely larger than whitebait. On one or two occasions I did have cause to regret the hotel security guards offer of escorting me to the beach, but by and large I found the local villagers to be a friendly enough bunch, but after a while the standard greeting of “hello my friend you give me one dollar” did grow somewhat tiresome.” I contemplated the idea of fishing from the beach, but the water inshore was very shallow and heavily coloured, and it was all to obvious that there was absolutely no way I would be left alone to fish. I spent a long day reading, sleeping and going for short walks. At breakfast on day two John’s phone once again chirped into life. Again I thought we were not going to get out fishing, but eventually he confirmed that his contact had indeed managed to obtain some fuel, but advised we needed quite a few gallons more to be able to fish the area he wanted. This was a problem, a very big problem, as fuel shortages were really beginning to grip the country and obtaining such a large quantity of fuel at such short notice just to go fishing was nigh on impossible. The hotels Swedish manager who had been seated drinking coffee with us suddenly got up and left, saying he had had an idea and he just might be able to help. We saw him drive out of the hotel in his battered Land Rover, and when by ten thirty he still hadn’t returned I’d given up all hope of fishing. Finally he did return, and along with a broad grin on his face he had 25 gallons of petrol in the back of the Land Rover. Apparently he’d visited the UN base located adjacent to the hotel and done a deal. The Ukrainian troops were based there and he’d banned them for their rowdiness the night we had arrived. He informed us they were now welcome to use the hotel pool and bar, and the ‘fee’ for the privilege was 25-gallons of petrol! By eleven we were on Mahera Beach complete with tackle and fuel, boarding a fast sports boat that had sped over the bay to from Freetown Aqua Sports Club to meet us. Quickly we loaded our gear and scrambled aboard, finally we were going fishing. Finally we went fishing, and caught some fish! It was only now that we got to meet John’s ‘contacts’, freelance South African ‘security advisors’ who had turned up for the day equipped with automatic 9mm ‘insurance’ in their holdalls to ensure our safety. Piracy and smuggling was rife off the coast of Sierra Leone, and yet again I found myself questioning my sanity. As we headed offshore soon we came upon a dilapidated trawler with a small high speed boat lashed alongside it, both crews hastily passing boxes from one to the other. Martin, who was driving the boat quickly altered course away from the scene and accelerated rapidly, taking us well away from whatever was going on. When finally we tackled up and started fishing we experienced an afternoon of truly tremendous sport. 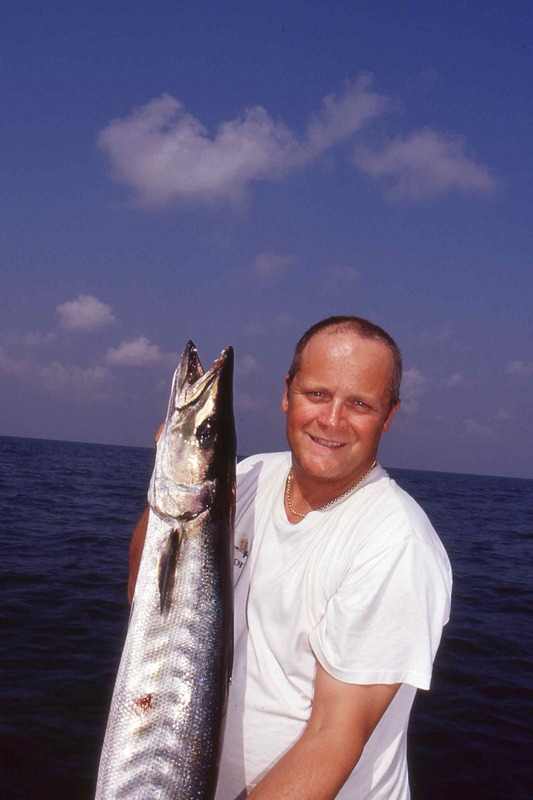 Trolling up to three deep diving lures at varying distances behind the boat, we criss-crossed an extensive reef and bank systems and caught good sized barracuda more or less at will. The fish averaged between 20-40lb apiece and on the 20lb class outfits we were fishing they provided great sport. Actually these were sub-species of the greater barracuda, known as the Guinean Barracuda, which are unique to parts of West Africa. Even though we were more than happy with the size of fish we were catching, so far as this species go our fish were barely average as specimens in excess of 50lb are common. 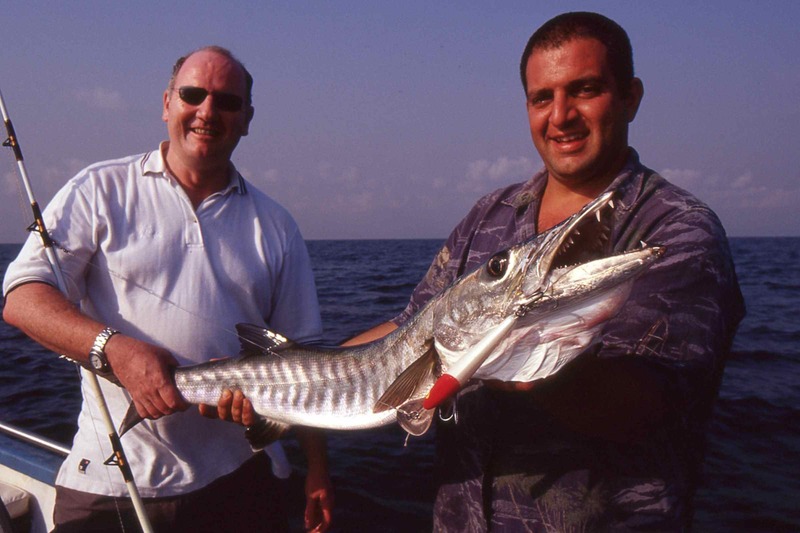 The I.G.F.A All-Tackle record for Guinean Barracuda is a staggering 50kg or 110.2lb. Often when the fish struck our lures they would clear the water to a distance of several feet, shaking their heads violently in a shower of spray as they attempted to shake the lure free from their jaws. Next came one, two or three fast and incredibly powerful runs, and often it was all that we could do to maintain tension on a fish as suddenly is reversed direction and ran directly back towards the boat. 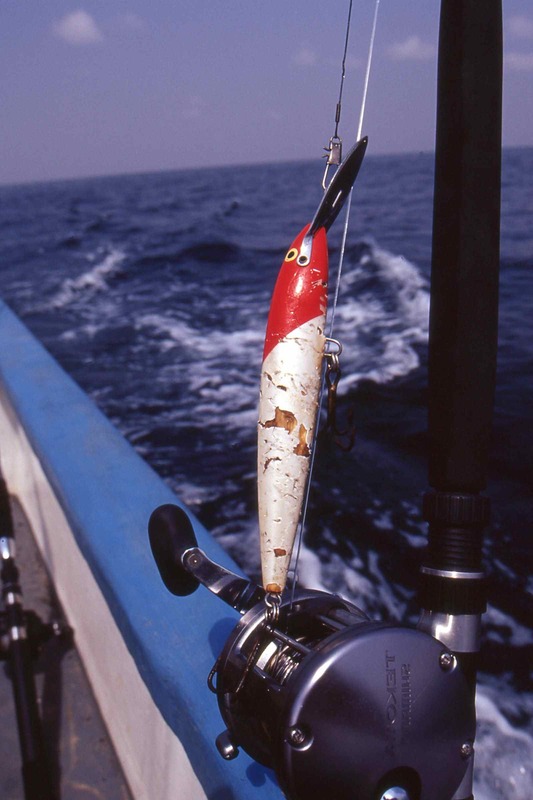 Often a hooked fish would explode into the air all but alongside the boat, and we as many as we landed. The Rapala and Storm lures we were using were big, substantially built affairs but the powerful jaws and razor sharp teeth of those fearsome fish very quickly demolished them. Rarely was it possible to catch more than three fish per lure before it was damaged beyond use and had to be replaced. A few Spanish mackerel added variety to our catch and while we never managed to actually hook and land one, on several occasions huge jack crevalle and African pompano followed our lures all the way to the boat, but refused to strike. Another local boat we came across was fishing at anchor over the reef, and clearly the anglers aboard her were enjoying an equally productive time fishing bottom baits for various species of snapper and grouper. For the time being at least, all thoughts of AK47 touting pirates and smugglers forgotten! As the sun descended towards the western horizon, it was time to retrieve our lures and head back to Mahera Beach. It had been calm when we left, but now a sizeable surf was pounding the shoreline, making it difficult to get the boat onto the beach and us ashore. As we approached the breaking surf line a group of several dozen local men came down to the waters edge. This is normal everywhere in Africa, where the possibility of a fish or a tip in return for helping out is always appreciated. On this occasion the unmistakeable sound of a 9mm round being chambered in anticipation of possible trouble served as an all to clear reminder that this wasn’t just another tourist beach in East Africa, but a remote stretch of coastline in one of the poorest of Third World countries. This was a place where a dollar earned allowing some rich tourist to take your picture was a significant bonus in any families budget, a place where crime involving theft and muggings was far from uncommon. 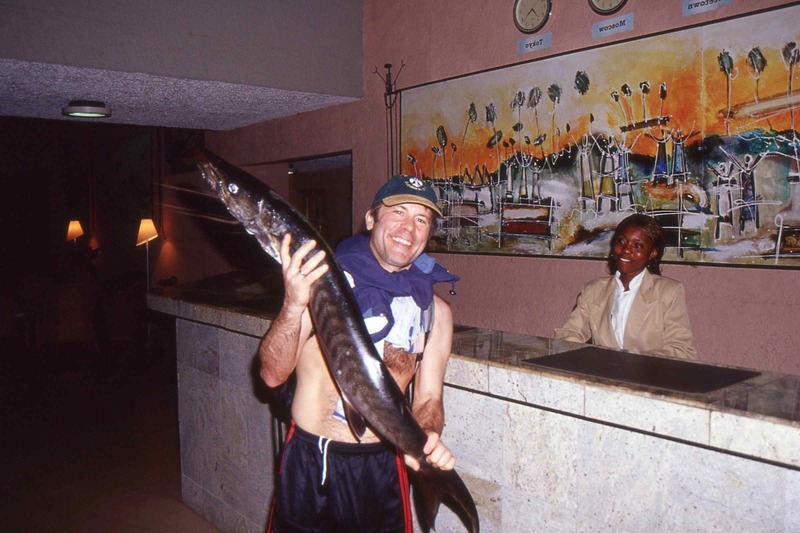 The hotel receptionist looks very impressed with Bruce’s fish; guess what was for dinner that night! Our third and last day again saw us again kicking our heels around the hotel, having given up any chance of obtaining anything like enough fuel to fish offshore again. Finally in the evening we once again boarded that rickety old bus that had somehow managed to return to take us back to the airport for our flight home. I am more than used to the organised chaos that is so typical of African airports, but I wasn’t prepared for the madness that waited for us that night at Lungi Airport. Think of the scenes of chaos shown in the old newsreel footage of the last Americans evacuating Saigon and you’ll get the picture! When finally John and Bruce taxied the 757 to the runway, accelerated and took us into the air I confess I breathed a huge sigh of relief. While it’s never wise to say never, I think it extremely unlikely I’ll ever return to Sierra Leone, certainly in the near future. This is a shame, as quite clearly the country has much to offer visiting tourists, including quality fishing, but from what I saw during my brief stay it still has a long, long way to go before it reaches that point. 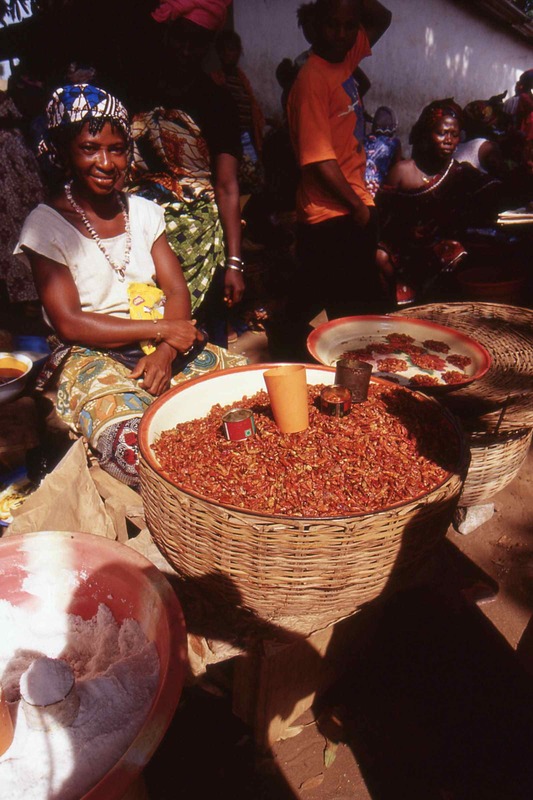 Hi Dave, I’ve recently returned to South Africa after seven years working in Sierra Leone. Excellent fishing around Sherbro Island passing through the mouth close to the Bonthe Village. Just as a matter of interest, I have an opportunity to develop a resort or few chalets sitting right on the beach at the mouth. The property stretches over 20 hectares and may one day invite you to catch some record Tarpon ! Thanks for getting in touch. Yes I hear Sherbro is the place for world record class tarpon. If you go ahead with your lodge I’d love to visit & have a shot at a seriously big tarpon. Keep in touch & all the very best. Cracking story Dave! 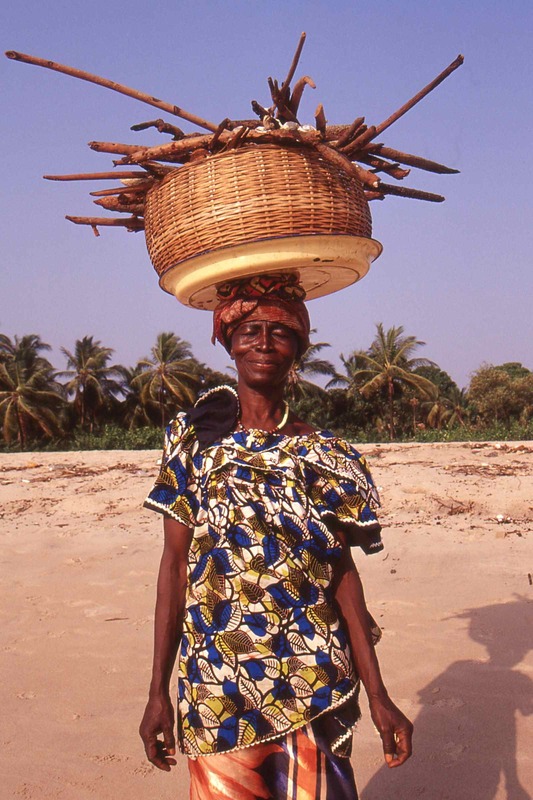 I’m just looking into going over to Sierra Leone for a weeks fishing and wondered what year it was that you visited? If it was last year I may look at my other African Adventure opportunities….